Chuck and I went to see War Room yesterday afternoon. To say it did not disappoint is an understatement…it awakened my heart…it renewed my love affair with Jesus. It reminded me of the power of passionate and deeply heart-felt prayer. I couldn’t wait to see this movie when I saw the previews. Nothing gets my spirit stirred like passion and prayer. This movie was filled with that. It’s amazing what being vulnerable with God does in people’s lives. That is what brings out our true Joy…vulnerability and real relationship with Christ. A couple of months ago Chuck and I were sitting on the beach basking in the serenity and beauty of God’s work, and I explained to him what I wanted for our family…what I wanted for our marriage…what I wanted for our lives. I guess that may sound strange as we have been married for 10 years, but this life is a journey and a process, and through the process of this journey, I realized what my true heart’s desire really is. It was a hard thing to explain, but after seeing this movie Chuck understood with his heart everything that I told him that night on the beach. My true heart’s desire is to commune with Jesus…to revel in the romance of Him…to dance in the adoration of Him…to feel His gaze deep within my soul…to live my life with Him in every moment. I want our home and our decisions to be led by Him. I want to experience intimacy with Him with my husband. I want the three of us to be so intertwined…like perichoresis – a fellowship of three co-equal beings perfectly embraced in love and harmony and expressing an intimacy that no one can humanly comprehend. If He is for us, who can be against us? As for me and my house, we will serve the Lord. These are my heart’s desires. If I have this, I have everything! 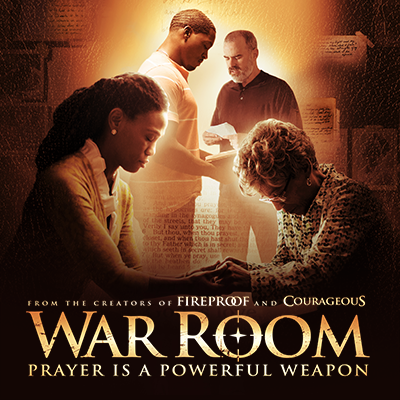 This movie encouraged us to start our own war room…something we started at the beginning of our marriage and somehow put down as life got in the way. I can’t wait to start the next chapter with my husband…I absolutely can’t wait. My heart is overflowing – my cup runneth over. I love the simplicity of my heart’s greatest desire. I love that I have had it all along…I just needed to lay some other things down that were getting in the way. I wish I could relay through this post all of the sweet things God is doing in our lives. I find myself excited with the faith and happiness of a child. I find that I can’t stop smiling with my face or my heart. This journey is so beautiful. This dance is so soft and tender. My prayer is that everyone would find this Romance and know this Love!